Oops, had this one backlogged. This is from May 15, a few days ago. SGamer: Thank you to LongDD for doing this interview with SGamer.com. Earlier in the afternoon, you had told me that you were at the airport; where are you now? LongDD: I’ve now arrived at the LGD team house. SGamer: When you first left LGD a few days back, was there any anger? LongDD: There wasn’t much anger, but there was a reluctatnce — I didn’t want to leave the pro scene, I didn’t want to give up on Seattle. SGamer: Was it that once you left the team, LGD would have to play in the TI3 qualifiers? Additionally, something many people are curious about — when LGD first announced you as an official member, was there any contract signed? LongDD: Indeed, because of my leaving the team, they would have to play in the qualifiers. My return this time is to accompany them along the way, to contribute that which I am able to. Everything was very rushed before so there was never any contract. SGamer: LGD had mentioned in their earlier announcement that they had made efforts to keep you around by offering you other positions with the team, but you had declined. Why did you decline at first, and then return? LongDD: Because I’d been playing professionally five years now, and had grown tired of floating around. After being out and about so many years, I wanted to go home. My role this time as a coach will still be a short one, just for a few days. SGamer: Who contacted you to invite you back as coach? Does this all mean that you will still be leaving LGD after TI3? SGamer: Why not choose to stick around with LGD, at least until after TI3? LongDD: I will not stay, because I feel weary in the heart. SGamer: Every in LGD is a veteran of the scene, so what will you mainly be responsible for? LongDD: I’ve just arrived back so I’m still not sure exactly what. I think it’ll be things like summarizing results and strategies, making suggestions for improvements on things I see in 3v3 scrims, bans and picks, etc. SGamer: How do you rate LGD’s current form? In terms of individual players do you think LGD can go toe-to-toe with iG? LongDD: I’ve always felt that LGD has exceptional players in their team. Their loss in the DSL to VG, I feel, is only down to a lack of preparation. SGamer: What do you think is the most important element of a typical competitive game now? Bans/pick stage? LongDD: Nowadays in professional matches, the bans/picks determines something like 60-70% of the outcome. The rest of it is down to lane setups and how each lane fares, as well as performance and team execution. The reason I say this is because player skill is very similar between top teams now. SGamer: Compared to the old mode of three bans in the first ban phase, what does the change to two bans bring? LongDD: It means that strategies are more varied. Bans/picks become more difficult to get right, and thus require more out of each team in order to achieve success. It requires teams to know how to play more different styles. So competitive games nowadays possess a higher degree of tactical thought. SGamer: What do you feel LGD’s greatest weakness right now? LongDD: Mainly it is that they lack a wider array of styles. They must understand this, and practice some more combinations, and work on their mentality. SGamer: Mentality? Are you saying their mentality right now isn’t in a good place? LongDD: I personally feel that they need to try more different things; they can’t only always run the same exact things. The new styles coming from many different teams are things that cannot simply be ignored. LongDD: Playing pro? The professional lifestyle is a brutally competitive one. Without the chance of a good team, I don’t want to strive for it any longer. Streaming is quite fun, I had been spending 16, 17 hours a day doing it — putting my life into it, haha. SGamer: Will you continue streaming after helping LGD with the TI3 qualifiers? SGamer: Under your tutelage, how do you think LGD will do at G-1? LongDD: I think they should be champions. SGamer: What is training like for LGD right now? Are they mainly scrimming with the Int squad or with other teams? LongDD: Yeah, the typical day is scrimming with various teams. During my time here I will help arrange some laning and bans/picks practices. SGamer: Which teams do you scrim more with?LongDD: All about the same, we contact all of them. SGamer: Do you feel that LGD is able to challenge iG’s position at the top? LongDD: I feel that there is a possibility, and the possibility is a big one. SGamer: Lastly, why don’t you bring this interview to an end? LongDD: Thank you to those friends who have supported me all along. I will eventually grow old, but I will not leave. 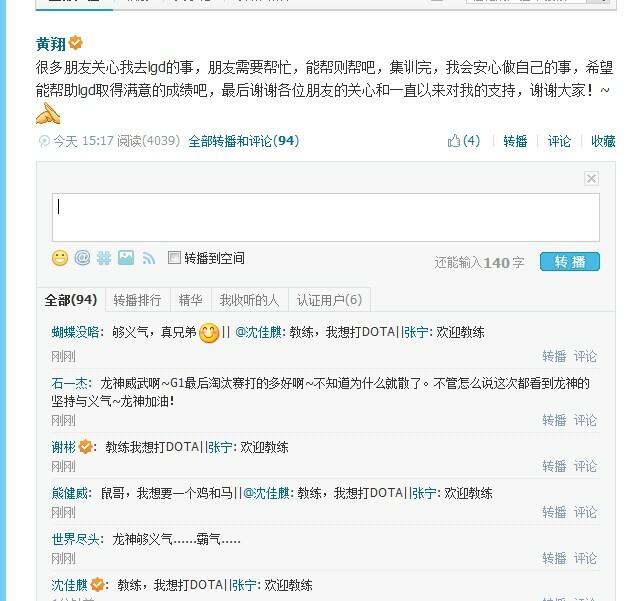 Players such as xiao8 and Sc/DD are seen replying to his post, welcoming him as coach. 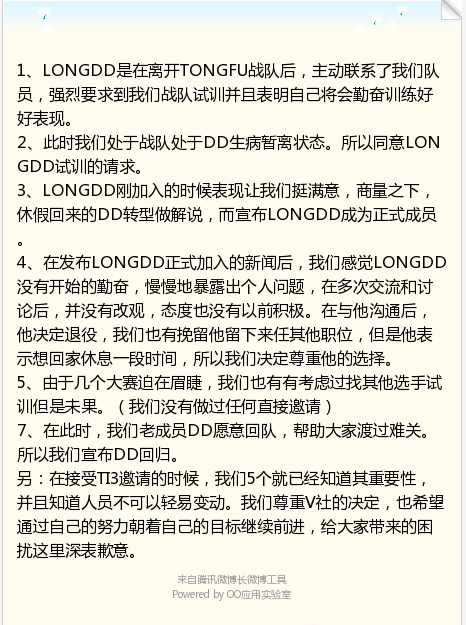 The truth behind LongDD leaving LGD.cn? Fan: What’s going on? I was looking forward to seeing you at TI3, how come you’re talking of retiring now… Add oil please, sincerely, the honest thoughts of a long-time fan of yours. Fan: The internal strife is that bad? LongDD: Thank you, in the future I’ll be doing vods, streams, come visit lots!